pansies, originally uploaded by jahansell. Driving up Route 41 yesterday to Canaan (to get my fingerprints taken at the police barracks!) I passed a sign on the Salisbury Garden Center saying "Pansies are In!" I wait eagerly every year for the pansies so stopped in on my way back south to pick up a flat. I tried to start some myself this year but neither they, nor anything else I have going in my basement, have sprouted. This has never happened to me before! Fresh seed, fresh potting mix, new flats (so no bacteria) regular watering...no heat, and maybe my lights are getting old...can't think of any other reason why they haven't sprouted. Yesterday the forecast said, high 50's and sunny. Instead, it was mid-40's, cloudy and rainy. Heartbreaking! Yet the crocuses in our garden are glowing, a few daffodils have popped open, and these pansies...heartbreakingly beautiful, aren't they? Pansies are one of my favorites. I also love the little Violas ("Johnny Jump-ups") that are really mini-pansies. Can't wait until I can set some pots of color around my patio...won't be until May here in Wisconsin. Thanks for posting this reminder that spring really is around the corner! Have you seen the crocuses on the Green in front of the library, right across from Kenny's? I saw them Monday when I went to the library. Beautiful. When it rains in April I have to remember Mr. Coffil my old Sharon Center School art teacher who would say, "April showers bring May flowers,and Mayflowers bring Pilgrims." 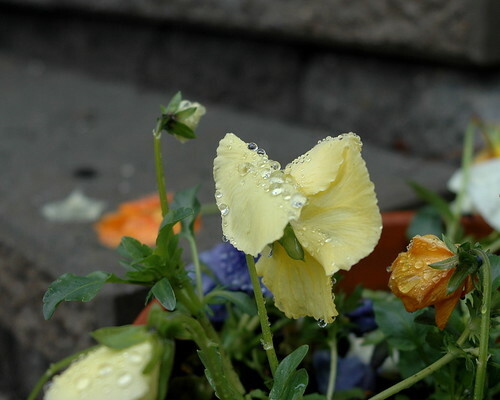 Wonderful pansies, in French we call them "pensées" which shares the spelling of "thoughts". It as called the memory flower ( close to the forget me not...).